The Computer Science Education Research Conference (CSERC) is an international forum for researchers with interests in all aspects of computer science education. It embraces a broad view of current and future trends in computer science education and aspires to be a lively environment for presenting the latest research results. It convenes yearly, in odd years it is co-located with the NIOC conferences, in even years with a fitting international conference in the field of computer science. 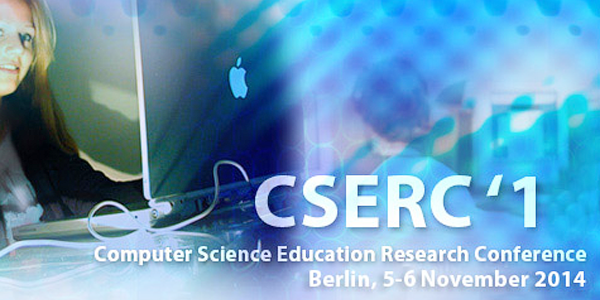 CSERC will be organised collocated with WiPSCE 2014. Although CSERC is organised separately, people attending either one, may freely visit the other. The two conferences take place at the same time, at the same locations. Every two years CSERC is organised in a different city in the Netherlands collocated with NIOC. In 2015 CSERC will be organised in Enschede. ← digiVita: meer meisjes in ICT!